Only a few things are known about Steed's family, not more than bits and pieces. Steed's mother -Mea or Mia (?) Steed (1850 - 1940), née Trent? Almost nothing is known about his mother; he mentions her only three times. The first time when he's talking about a Great auntie on "his mother's side" (My Wildest Dreams), a second time in Two's a Crowd, when Mrs. Peel insists that she just saw Steed and he answers that his mother would have told him if he had a twin and in series 6 episode Fog: "Ah poor mother, I wonder, how she's getting on". Steed's father - William Steed (1849 - 1936)? Steed also mentions his father four times in other episodes: the first time in The Secrets Broker, when he's discussing how his father refused to drink Riesling, the second time in Silent Dust, which could be an information that his father is dead, as he says “my old father would spin in his grave”, but one can’t be sure if he is serious. Steed is referring to his father a third time in the episode From Venus with Love when he says to Venus: "Following Father's footsteps", and a fourth time when he tells Tara about sneaking into his father's study to steal tonic water in My Wildest Dream. In The White Dwarf script, Steed explicitly says he doesn't have a brother. But the dialogue is different in the episode. STEED: I should be very surprised, I haven't got a brother. So John Steed has at least one sibling, and it has to be a sister. This sister could be the mother of Steed’s 13-year-old nephew (Legacy of Death). Steed bought a Spitfire model for the boy, who was first mentioned three years before in The Gravediggers, where Steed is playing with a toy gun that he originally bought for the kid as a birthday present. In Love All he told Tara that he went to met his nice from school. Either she is the daughter of the same sister, or there is more than one sister, which is highly possible, because there are obviously more female than male Steeds, judging from the numerous aunts he frequently mentions. According to a fictionalized biography by Roger Davies in fanzine On Target Volume 2, Issue 4, pages 3, John was the youngest of eight children, and he had seven older sisters. There also is an Uncle, who served in World War I, it's the one with the golden Hunter watch in Dial a Deadly Number, who got kicked by a Canadian mule. Perhaps his uncle died only recently around that time, as Steed says that he got the watch as a „Legacy from my uncle“. Maybe it's the same uncle who gave Steed a solid gold toothpick, a bequest from his uncle Joe, in The £50.000 Breakfast? Or is it the uncle who "sired nineteen children" (TNA Sleeper)? Steed's uncle is a chess Grand Master (Requiem), and he has one cousin, named Demon Desmond (Steed), who's world Ludo champion. Steed often tells stories and anecdotes about his numerous aunties, but one can not be sure if he's telling the truth. 1. Auntie Penelope, who sent him the rock cakes in Dead Man's Treasure (he is referring to her in A Surfeit of H2O too). 2. Auntie Emily as he "received a hamper of cold goodies from his aunt Emily" in Pandora, where he invites Tara for dinner. 3. Auntie Ermyntrude. This auntie died young of a cold (You'll Catch Your Death). The first auntie ever is mentioned in A Chorus of Frogs, an aunt in Rottingdean, a village near Brighton. He talks about aunties, such as Queenie in November Five, Emily in Game, False Witness and Pandora, Aunt Penelope in Dead Man's Treasure, aunties Flora and Clara are mentioned in Fog, Mrs. Sybil Peabody, who was very font of alcohol in Sense of History, Silent Dust and The £50.000 Breakfast, aunt Tibby in Lobster Quadrille and he had a great aunt on his mother's side, who was "ruthless with a knitting needle" (My Wildest Dream). Steed mentioned another auntie who tends to be avaricious in Escape in Time when he's looking at some photos of enemy agents. Some believe that Steed looks a lot like his granny (The Girl From Auntie). Dr. Spender from Second Sight is an old friend of the Steed family, and he's surprised that Steed has become a "Whitehall man". The links present portraits painted by Sir Daniel Macnee. The first shows Sir Daniel Macnee's daughter (later Mrs. Wiseman) and Lady Macnee with her daughter (Mary Marcella?) painted in 1863. And finally, there is that painting above Steed's mantlepiece in his second flat which shows his grandfather R.K.J.J. de V. Steed in 1892. This is the only known picture of a family member. There're many pictures or photos in other flats (such as the photos on his secretary in 4 Queen Anne's Court or at the sideboard in the living room at Steed's Stud) but it's unknown if one of them is a family member. The missing family photos could be a safety mechanism to protect his family or to prevent being blackmailed because Steed has photos of his schoolmates or colleagues (TNA Dead Men are Dangerous, Medium Rare), but not a single photo of his niece, nephew or sister anywhere. Steed mentions his grandfather (grandfather's watch) in series 6 Have Guns - Will Haggle. Mrs Gladys Culpepper (Who WasThat Man I Saw You With?, series 6) knew Steed's grandfather: "A charming man he was." 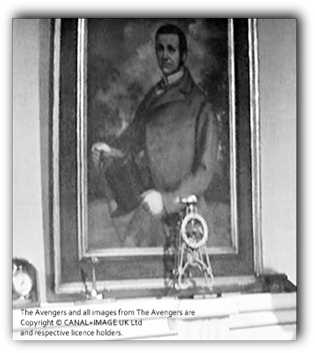 Right: Painting above the mantlepiece in Steed’s second flat, showing R.K.J.J.de V. Steed presented by the Bagnell and Wintle Hunt 1892 in The Nutshell. 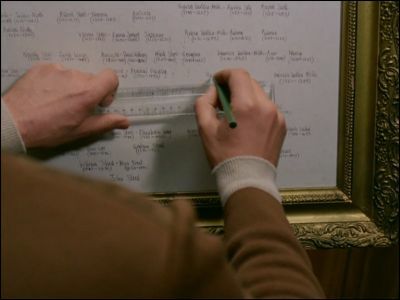 But according to the family tree from Requiem Steed's grandpa already died in 1881! Perhaps the painting is a hommage to (Daniel) Patrick Macnee’s ancestor, Sir Daniel Macnee (1806-1882), the Scottish portrait painter.who was his great-grandfather. According to the family tree that Steed made in series 6 episode Requiem, the name of his father would have been William Steed (1849 - 1936) and his mother Mea or Mia (?) Steed (1850 - 1940), née Trent, his grandfather's Christian name was Rupert (that's the Christian name of Macnee's son) Steed and grand-uncle's name Graham Steed, his grand grandfather's name would have been James Steed. But it would also mean that Steed's mother would have been 72 years old when she was pregnant - so Steed can't be serious! Dr.Spender and Mrs Culpepper know the Steed family or at least the know members of the family. Steed asks Mrs Gale to take care of Dr Spender (Second Sight), who is an old friend of the (Steed) family.